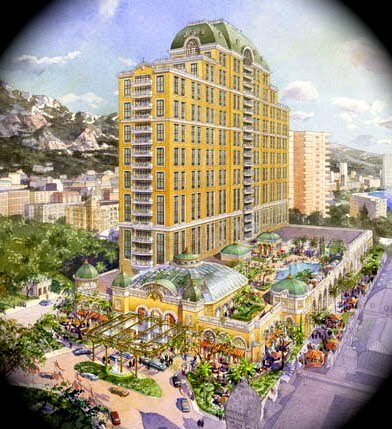 This is a rendition of what should have been Wynn-Monaco. It was to have been built upon land reclaimed from the sea, the Larvotto extension project. Millions of euros were spent by vendors to conduct extensive research, construct renderings and propose minutely detailed bids. But it all came crashing down when Prince Albert II cancelled what should have been the principality's biggest ever money-spinner. Perhaps Las Vegas casino mogul Steve WYNN remains unaware that Albert's lawyer, Thierry LACOSTE, and Albert's accountant, Claude PALMERO, talked the Prince into terminating the project due to so-called "environmental concerns." LACOSTE and PALMERO had a secret vested interest in a vendor that was ruled out of the final round. But WYNN has done okay from his connection to Monaco. In 2003, Monaco put $45 million into Wynn company coffers--an amount that would today solve the principality's economic problems for many years.